Jeanne d'Arc (Joan of Arc in English) was born in Domrémy (Lorraine) in 1412, daughter of Jacques d'Arc and Isabelle Romée (died 1458). She played a major (and somewhat mysterious) role in rallying the flagging forces of Charles VII against the English occupier in 1429, leading her troups to breaking the siege of Orléans and having Charles VII officially crowned king in Reims the same year. She was later captured and sold to the English, who burned her at the stake for heresy and perjury in 1431, in Rouen. Her case was officially reopened and the sentence annulled in 1456. 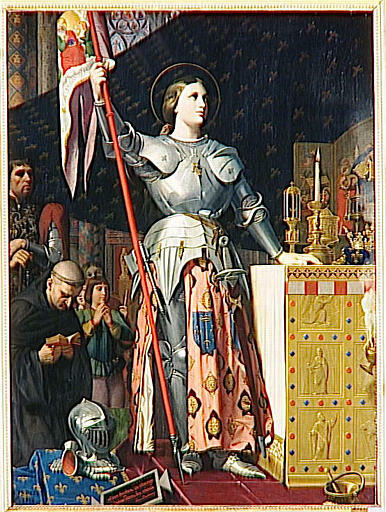 Jeanne d'Arc at the coronation of Charles VII, by Ingres. Notice that her arms appear on her coat-armour. (France, Ministère de la Culture, base de données Joconde). Because of her remarkable actions, Charles VII granted her family arms and nobility. The arms were: Azure a sword per pale argent hilted or between a crown in chief and two fleurs-de-lys of the last. The symbolism of the arms is fairly obvious. She testified at her trial that she never used those arms personally, only displaying her famous banner (white, with an image of God holding the world between two angels, and the words Jhesus Maria). The arms were also granted to her family, and it must have taken place in 1429. The family was also authorized to adopt the name of Du Lys. The text of the grant of nobility (Dec 1429) survives. It was made in favor of her parents, her three brothers Jacquemin, Jean and Pierre, and their descendants male and female, in perpetuity. Thus, in her family, nobility was transmitted by females. It was confirmed in October 1550, on petition of Robert Le Fournier, baron de Tournebeu, and his nephew Lucas du Chemin, seigneur du Féron, both descended from a daughter of Pierre du Lys. The Arc family seemed to have arms prior to these events, namely: Azure a bow or in fess, thereon three arrows crossed ..., on a chief argent a lion passant gules [note: I am told that the Darc family home in Domrémy displays somewhat different arms above the door: three arrowheads surrounding some object. But those arms are a later addition.] Of her three brothers, two had issue: the descendants of Jean adopted the name of Du Lys and used the arms. Pierre, who became a knight, had two sons: Jean, knight, who left only a daughter, and Jean the younger, who was briefly Échevin of Arras in the 1480s. He returned to France and kept the name of Du Lys, but resumed the arms of Arc. His great-grandsons Charles and Luc du Lys, seigneur de Reinemoulin, petitioned for the right to quarter du Lys and d'Arc, which was granted by Letters Patent of November 25, 1612. The same letters granted to Charles a crest representing Jeanne d'Arc proper, holding a sword surmounted by a crown or in one hand and her banner in the other, and the war-cry La Pucelle!. 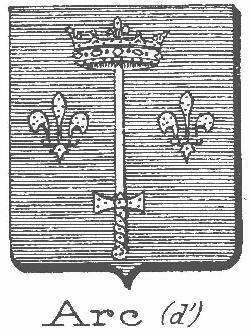 Luc received a crest of a fleur-de-lys or issuant between two banners as before, with war-cry: Les Lys!. The special privilege of female transmission of nobility was a fiscal danger: since nobles were exempted from certain taxes, notably the taille, the number of tax exemptions could unduly increase. As a result, as part of a reform of the taille in June 1614, the privilege was curtailed. Those descendants who had already claimed and were enjoying nobility could retain it and transmit it to their posterity in male line. Those who were not "living nobly" could not claim the privilege anymore. Women ceased to transmit nobility. a"Les descendans des frères de la Pucelle d'Orléans, qui vivent à présent noblement, jouiront Å l'avenir des priviléges de noblesse, et leur postérité de masle en masle vivant noblement, même ceux qui pour cet effet ont obtenu nos lettres patentes et arrests de nos cours souveraines, mais ceux qui n'ont vécu et ne vivent à présent noblement, ne jouiront plus à l'avenir d'aucuns priviléges. Les filles et femmes aussi descendues des frères de ladite pucelle d'Orléans, n'annobliront plus leurs maris à l'avenir." (Edit sur les tailles, June 1614, art. 10; in Isambert: Recueil général des anciennes lois françaises , vol. 16, p. 48).